Albert Baker was born in New York circa 1836. He married Sarah Ann Smith on December 9, 1856 at Lyon MI; they made their home in Sibley's Corners (Wixom) where he was a carpenter. They had two children, Lewis and Lucy. The 1860 U.S. Census shows that Jennie Smith, a 20 year old black woman, also lived with the Baker family. She is the first black female resident of Commerce Township and Wixom, according to U.S. Census records. When former Governor Moses Wisner was named Colonel of the Michigan 22nd Infantry during the Civil War, the men of southeast Michigan were recruited to serve. Albert Baker answered the call, enlisting for 3 years when he was about 26 years old. One can only imagine the difficulty of leaving behind a wife and 2 young children, the younger of which was only 7 months old. Albert was made a Corporal on September 4, 1862, the day the regiment left Pontiac MI; he was later promoted to Sergeant. His regiment fought in the Battle of Chickamauga, where there were over 16,000 Union and 18,000 Confederate casualties, the highest losses of any battle in the Western war zones. Sergeant Baker was wounded in action and taken prisoner on the last day of the battle, September 20, 1863. Although he was paroled, probably due to the severity of his injuries, Sgt. Baker died October 22, 1863 from his wounds, one month after his capture. He is buried in Chattanooga National Cemetery. Sergeant Albert Baker is the only known Wixom resident to die in the Civil War. After his death, Albert's widow Sarah and young children moved to nearby Lyon, where Sarah became a housekeeper for prominent farmer Jay Marlatt. (Before the Civil War, Marlatt had employed another member of Company I of Michigan's 22nd Infantry, Noah Eckler.) Sarah and Jay married in 1875. Lucy later married neighbor Adelbert Hopkins. Adelbert Hopkins and Lewis Baker built a hotel in South Lyon MI, where they were the first proprietors. (This building, today a popular restaurant known as The South Lyon Hotel, suffered heavy damage in an accidental fire in June of 2016.) After Sarah's death, Adelbert and Lucy moved to Wixom. Adelbert built a barn that is still standing today. Originally known as the Munshaw Barn, today it is rightfully called Hopkins Barn. Sarah, Lucy and Adelbert are buried in Wixom Cemetery. Finding historically correct information about Warren Baker has proved to be difficult at times, because some records are contradictory, and others are incomplete. The facts listed here have been confirmed through written sources. Warren was the son of Abner and Lavinie Baker, and was born in Michigan. In 1850, Warren lived in Novi MI with his parents. Ten years later, at the time of the 1860 U.S. census, he was listed as a resident in two townships: in Milford, living with with his parents, and in Commerce (now Wixom), living in the home of Willard Wixom, where he worked as a farmhand. The Milford Times reported that as a new Union Army recruit, Warren was one of 8 local men from Company I who reportedly "borrowed" a bell the from a cow belonging to a farm in Walled Lake. The bell would become the regiment's famed mascot. That story would lead one to conclude that he enlisted and was mustered in August of 1862. Warren Baker is listed in the National Park Service Civil War Soldiers Index as having served in both the Michigan 2nd Infantry, as a corporal and the Michigan 22nd Infantry, as a private. He is listed in the state of Michigan's book about the Michigan 2nd Infantry, the Record of Service of Michigan Volunteers in the Civil War Volume 2, but he is not listed in the state of Michigan's book about the Michigan 22nd Infantry, the Record of Service of Michigan Volunteers in the Civil War Volume 22. U.S. Civil War Draft Registration Records 1863-1865 shows Warren Baker as a resident of Milford in June 1863, with his occupation as a mechanic, and previous military experience in Michigan 22nd Infantry. Civil War pension records state that Warren Baker received a pension for a wound to his cheek and right shoulder, resulting in neuratrophy and rheumatism. The pension record lists him as a veteran from Michigan 2nd Infantry Company B. After the war, Baker settled in Iosco Township in Livingston County with his wife Harriet (nee Perrigo). Harriet's sister Charlotte was married to fellow Company I Michigan 22nd Infantry veteran Daniel Johnson Jr. Harriet's brother George was married to Edna Hopkins. Edna's brother Adelbert was married to Lucy Baker, who was the daughter of Albert Baker, another local member of Company I Michigan 22nd infantry. Warren and Harriet had 3 sons, Lamont, Stephen and George. Stephen and George married sisters, Carrie and Effie Fewless. Warren died at age 56. An 1896 newspaper story reporting his death stated that he had been a member of the Michigan 22nd Infantry, and had been shot through his lungs during a Civil War battle, never fully recovering from the effects of his injury. The death date matches the pension records, though the regiments are different. Harriet died nearly seven years after Warren, on August 1, 1902. Warren and Harriet are buried in Lakeside Cemetery in Livingston County MI. Cornelius Barrett was the son of Michigan pioneers Timothy and Sabra Barrett. He grew up on his parents 240 acre farm which encompassed the eastern half of Loon Lake in today's Wixom Michigan. Private Cornelius Barrett served honorably in the Union Army during the Civil War; he was discharged due to disability. His brother, Jerome, also served in the Union Army. Cornelius' first wife was Alta A. Mead, who was the mother of his children. After her death in 1882, he married Celia N. McConnell. They were wed in Ionia County on May 20, 1885. Cornelius worked with real estate, and was a pension attorney; he was postmaster of Charlotte for at least 2 terms, in 1885 and 1886. Cornelius and Alta Barrett are buried in Maple Hill Cemetery in Charlotte MI. Jerome Barrett was the son of Michigan pioneers Timothy and Sabra Barrett, and younger brother of local Civil War veteran Cornelius Barrett. Jerome grew up on the family's 240 acre farm in Commerce (now Wixom) Michigan on the eastern shore of Loon Lake. Private Barrett served honorably in the Union Army during the Civil War. As a member of the Cavalry, he was an excellent horseman. After the war, he married Matilda Sarah Taylor, who was the daughter of Jacob Taylor. The Taylors' farm was located near the Barrett home, indicating that Jerome and Matilda knew each other from childhood. The marriage took place in Commerce Township on March 13, 1869. The couple made their home in nearby Novi early in their marriage, but eventually settled in Midland Michigan, where Jerome was a farmer. Both Jerome and Matilda are buried in Midland Cemetery. Justus Beebe was the son of Michigan pioneers Anson and Betsey (Hovey) Beebe. Justus and his four siblings grew up on the family farm in Highland, where his father had taken up 80 acres from the government in 1834. At age 24 Justus enlisted as a Corporal, and was promoted to Sergeant the following year, in June of 1862. He took part in all engagements of his regiment during the Civil War while stationed near Beaufort, North Carolina, under the direction of Colonel Fenton. He was discharged at Newport News due to an accidental injury. Justus married Caroline M. Tenny of Macomb County on February 8, 1868. Justus Beebe graduated from the University of Michigan Medical School in 1874. Not only was he Wixom's doctor, he also operated a drug store in the locality. He established the Eclipse Cheese Factory circa 1889 with business partner Robert McKinney. Dr. Beebe was a member of Wixom's Free Will Baptist Church, a Master Mason, and a member of the Heber Le Favour G.A.R. Post 181 of Milford. Caroline was a member of the Women's Relief Corp (W.R.C) of Milford. Caroline died June 20, 1903, three years before her husband. Dr. and Mrs. Beebe are buried in Wixom Cemetery. Justus Beebe, M.D. is featured in the book Biographical Sketches of Leading Citizens of Oakland County Michigan, 1903 edition, pp. 316-7, and is included in the book Record of Service, Eighth Michigan Infantry, Civil War 1861-1865, p. 12. Marvin Bogart recalled being 5 to 10 years old when he moved with his family to Novi Township (now Wixom), on a farm south of Grand River Ave. He attended the district school in Novi, and a seminary in Ypsilanti. He enlisted as a Corporal in the Union Army at age 22. He was promoted to Sergeant on July 25, 1863. Bogart was captured in Georgia during the Battle of Chickamauga. He was held as a POW for 18 months at Andersonville, one of the most notorious prison camps of the Civil War, where many perished. Two months after he was released during a prisoner exchange, Sergeant Bogart was mustered out with his regiment. He later received a pension from the federal government as a result of a wartime hip injury. After the war, Marvin returned to the family farm, where he continued to live most of his life. He became an active member of the Wixom Farmer's Club. In addition to farming, Marvin was also a teacher. In 1873, he was to asked to fill a vacancy as Justice of the Peace in Novi, and in 1875 was elected for a full term. He joined Wixom's Free Will Baptist Church in 1884. A devout church member, he donated the church baptistery in 1927. He was often asked to recall memories of earlier days, historical stories which were recorded in several newspapers. His wife, Sarah (nee: Kimmis), was a cousin of Henry Ford. For Mr. Bogart's 83rd birthday, Mr. Ford gave him a brand new car. Marvin then learned how to drive. Sarah died in 1903, Marvin lived 35 more years. Living to age 98, Sergeant Bogart was one of the longest surviving Civil War Veterans in Oakland County. He was the long-time caretaker of Michigan Twenty Second Infantry's mascot, the locally famous cowbell. He was a member of the G.A.R., belonging to the Northville MI post at the time of his death. Marvin and Sarah are buried in Wixom Cemetery. Marvin Boget (SIC) is included in the book Record of Service, Michigan Volunteers in the Civil War 1861-1865, vol. 22, p. 30, and Sons of Union Veterans of the Civil War, by Barbara Stachura, p. 50. Leo Bryant registered on June 5, 1918. He was draft number 1. He is buried in Wixom Cemetery. Edwin Bullard was the son of Alphius and Mary or Patti (nee: Green) Bullard. Though Edwin was born in New York, the family lived in Commerce Township MI by 1840, according to U.S. Census records. Edwin married Caroline Patten, in Commerce, Michigan on January 19, 1841, when he was 21 years old and she was 16. Both were Commerce Township residents at the time of their marriage. Alonzo Sibley was one of the witnesses. Edwin and Caroline's children were George, Silas, Mary, Mertins and John. At the time of the 1850 U.S. Census, the family resided in Commerce (now Wixom.) It is unknown what happened to Caroline, but Edwin married Elizabeth (Eliza) Rykeman or Wrightman on December 30, 1854. They had three children: Martha, Oliver and Sarah Jane. At the time of the 1860 census, Edwin, Eliza, their children and John lived in Commerce. Edwin joined his neighbors and enlisted in the Union Army from Commerce at age 43; he is the oldest known Wixom resident to enlist in the Civil War. Private Edwin Bullard was discharged for disability at Detroit on July 1, 1863. He returned to the family farm. Edwin and Eliza were still living in Commerce in 1870. The 1872 Commerce Township plat map shows that Edwin owned a 62 acre farm southeast of Loon Lake; Loon Lake Road runs through his property. Edwin and Eliza moved to Danby Township in Ionia County by 1880. Eliza died shortly after the move, on August 20, 1880. Edwin married Cynthia Ann Quinn Pogue in Portland MI in Ionia County on February 2, 1884. Cynthia passed away on March 12, 1899. Edwin then married Margaret Lands Ford on September 12, 1899. It is unknown when she passed away, but the 1910 census lists Edwin as a widower. Edwin Bullard died at age 91. An obituary in the Portland Observer from June 21, 1910 gives additional details. Edwin and Cynthia are buried in Portland Cemetery. James Calhoun was born in New York, the son of Matthew and Agnes (nee: Morrison) Calhoun. The family settled in Sibley's Corners (now Wixom), where James and his siblings grew up on the family farm. At age 23, James enlisted in the Union Army for three years, along with his older brother, Thomas. Both brothers were among 8 men of Company I that were reported to have "borrowed" a cowbell from a Walled Lake farm on September 3, 1862, which subsequently became the infantry's famed mascot. During the war, James was taken prisoner in Atlanta GA in the fall of 1864. After being held captive for seven months, Corporal James Calhoun was exchanged and returned to his regiment. Six weeks later, they were all mustered out. In 1879, the Michigan 22nd Infantry held its annual veteran's reunion, in Wixom. The Milford Times reported that James Calhoun brought the cowbell to the soldier's reunion from his home in Franklin MI, indicating that he had been caretaker of the bell at that time. James married Polly Ann Pratt Durkee, a widow, October 12, 1881. After passing away at the age of 70, James Calhoun was laid to rest in Walled Lake Cemetery. Thomas Calhoun was born in New York, the son of Matthew and Agnes (nee: Morrison) Calhoun. This pioneer family moved to the Sibley's Corner's area of Commerce (Wixom) Michigan in 1836. Thomas enlisted in the Union Army when he was 29 years old, along with his younger brother, James. They were mustered on the same day. Thomas and James were reported to be among 8 members of Company I that "borrowed" a cowbell from a Walled Lake farm on September 3, 1862, which would later become the mascot of the Michigan 22nd Infantry. After completion of his tour of duty, Thomas was mustered out with his regiment. He married Melvina Rhoades on April 9, 1868 in Plymouth MI. They had one son, Frank. The family lived in Oakland County Michigan: Holly in 1870, Milford by 1880, and later settling in Northville. After his death, Thomas was laid to rest in Walled Lake Cemetery. Harry C. Cherry, his wife Viola, and two sons, Carl and Thomas, are buried in Wixom Cemetery. Private Ralph L. Curtis Sr.
Ralph L. Curtis Sr. is buried in Wixom Cemetery. Honors: Airman First Class Earl Davis was awarded the Purple Heart, the Korean Service Medal, the United Nations Service Medal, the National Defense Service Medal, the Korean Presidential Unit Citation and the Republic of Korea War Service Medal. Airman First Class Davis, of Wixom MI, was a crew member of a B-29A Superfortress Bomber with the 28th Bomber Squadron, 19th Bomber Group. As his plane was returning from a bombing mission, it crashed during the landing approach to Pohang Air Field, South Korea. All thirteen on board the aircraft, including Airman First Class Davis, were killed in this non-hostile aircraft crash. He is buried in Wixom Cemetery. POW: Taken as a prisoner November 23, 1864 in Henryville TN. The life of Mortimer Dutcher took many twists and turns. He was born circa 1843, the son of Wixom pioneer Daniel Dutcher. Mortimer's mother died when he was very young. Mrs. Dutcher is buried in Wixom Cemetery, but her first name and death date are unknown. Daniel married Mary Lambert in 1846. The Dutcher family moved from the area, and was living in the Saginaw area by 1850. Mortimer enlisted with Company E First U.S. Lancers, in Bay City, on November 3, 1861 when he was 19. He was mustered December 23, 1861. The regiment was not accepted for service because it included too many Canadian citizens. Dutcher was mustered out on March 19, 1862. On September 3, 1864, Mortimer enlisted with Michigan 8th Cavalry, when he was 20 years old. He joined the regiment in Nicholasville KY on October 2. The following month, on November 23, he received a gun shot wound during a skirmish with the enemy, which shattered the bone just below his right knee. He was subsequently taken prisoner. He was admitted to Brown General Hospital in Louisville on February 9, 1865 and was transferred to Detroit's Harper U.S. Army General Hospital on May 9. Private Mortimer Dutcher was discharged from the Army two months later. He never fully regained the use of his right leg. After the war, he engaged in some youthful indiscretions, causing some to dub him, "the Shame of Saginaw." He moved away, and went by the alias James M. Monroe for the rest of his life. He married Jane McNeil; they had a family and eventually settled in Illinois. James worked for the Wabash, St Louis & Pacific Rail Road Company, until his untimely death at age 42. He was accidentally killed while coupling railroad cars in Chicago; he could not move quickly due to his lame right leg. It took thirteen years and multiple depositions for Jane to obtain U.S. Army widow's benefits because of the use of the alias. The Dutcher family may have been related to William Lambert, another Civil War soldier who enlisted with the U.S. Lancers, and whose biography appears on this page. William may have been the brother of Mary Lambert Dutcher, Mortimer's step-mother. Noah Eckler was born in New York, but by 1850, he and his family were living in Milford MI. In 1860, he was employed as a laborer at the large farm of Jay Marlatt in nearby Lyon. (Jay Marlatt would later marry Sarah Baker, widow of Sergeant Albert Baker, a local soldier also from Company I Michigan 22nd Infantry who was killed as a result of wounds received in the Battle of Chickamauga.) Eckler enlisted in the Union Army when he was 19. He was one of eight local men of Company I who was reported to have "borrowed" the Michigan 22nd Infantry's cowbell mascot from a Walled Lake farm. Six months after entering the service, in February 1863, Private Noah Echler (SIC) was with the Ohio 18th Battery. He was promoted to Corporal less than one year later. After completing his term of service, he was mustered out with his regiment. Online genealogy records indicate that Eckler was a Fredonia Minister and a tobacconist. He married Ella Lusk December 22, 1875, in Jackson. They had one son, Charlie. After Ella's passing in 1889, Noah married Leefe Brown. Noah died soon after, May 8, 1890. Honors: Lance Corporal Ellsworth was awarded the Bronze Star Medal with Combat Distinguishing Device, and the Purple Heart. A monument to honor Lance Corporal Ellsworth and other soldiers is located in Island Park, Mt. Pleasant, MI. While growing up, Wixom resident Justin Ellsworth also spent time in Mount Pleasant and Lansing, Michigan. Always full of fun and adventure, and usually wearing his favorite cowboy hat, he was much loved by all who had the pleasure of knowing him. Justin enlisted in the United States Marine Corps in 2003. He died heroically, at age 20, with four other Marines, as a result of enemy action, a roadside bomb, southeast of Fallujah. The official wording of Lance Corporal Ellsworth's Bronze Star Award summarizes his heroic actions: "Lance Corporal Ellsworth's selfless dedication and personal bravery in the face of grave danger were heroic. His sacrifice prevented the serious injury or loss of further life among his fellow Marines. Lance Corporal Ellsworth's actions and service are deserving of recognition consistent with that of the Bronze Star Medal with Combat Distinguishing Device. His courageous actions and exceptional dedication reflected great credit upon him and were in keeping with the highest traditions of the Marine Corps and United States Naval Service. For heroic achievement in connection with combat operations against the enemy while serving as Combat Engineer, 2d Platoon, Company A, 2d Reconnaissance Battalion, 1st Marine Division in support of Operation IRAQI FREEDOM II on 13 November 2004. While conducting a dismounted combat patrol, Lance Corporal Ellsworth received an initial reading on his metal detector indicating the potential for a possible improvised explosive device. He realized that the potential explosive device was only 50 meters away from the patrol base and numerous Marines were in the near proximity; he immediately focused his efforts to identify and neutralize the threat to his unit. Demonstrating a complete disregard for his own personal welfare, he selflessly moved forward exposing himself to the potentially lethal effects of the explosive. Once Lance Corporal Ellsworth positively identified the location of the improvised explosive device, determined that it was not wired and it that it was in all probability a remote controlled device, he immediately sounded the warning for his fellow Marines to clear the area. Only seconds later, the improvised explosive device was detonated by the enemy, mortally wounding Lance Corporal Ellsworth. There were a total of 11 Marines within 30 meters of the detonation, and another four Marines within 30 meters. Lance Corporal Ellsworth courage and decisive actions placed him in a position in which he absorbed the majority of the blast and prevented further loss of life or injury to the members of his team and platoon. By his zealous initiative, courageous actions and exceptional dedication to duty, Lance Corporal Ellsworth reflected great credit upon himself and upheld the highest traditions of the Marine Corps and the United States Naval Service." A monument in Mount Pleasant dedicated to him and other soldiers reads, in part, "In honor of all who have served in Operation Iraqi Freedom & Operation Enduring Freedom. Never forget those who have paid the ultimate sacrifice. In memory of LCPL Justin M. Ellsworth USMC Charlie Co. 7th ESB Combat Engineer 2nd Reconnaissance Battalion." He is buried in Evergreen Cemetery, Lansing. His death received national attention when his parents convinced Yahoo to provide access to email messages he had sent and received before his death. His father, Wolverine Lake Police Chief John Ellsworth, established Military Families United in honor of Justin, and is the national chairperson. This organization honors fallen military members, supports those that fight, and serves their families. The group is part of a coalition of Gold Star and Blue Star families. John Finlayson is buried in Wixom Cemetery. Honors: Private First Class Furmark was awarded the Purple Heart. He is memorialized on the Tablets of the Missing in the American Cemetery in Normandy, Colleville-sur-Mer, France. Carl Furmark, who was born around 1925, was the son of John and Esther Furmark. On Christmas Eve, 1944, when he was about 19 years old, he was among 2235 American soldiers of the 66th Infantry Division who were crossing the English Channel from Southampton, England, heading to Cherbourg, France. Their Belgian ship, the SS Leopoldville, was struck by a torpedo from the German submarine U-486, about 5 miles from their destination. The ship sank within 2 1/2 hours. Due to bad weather, frigid water temperatures and reduced availability of rescue operations due to the holiday, 763 soldiers perished. PFC Carl E. Furmark was among the 493 men whose bodies were never recovered. Author Clive Cussler and the National Underwater and Marine Agency discovered the wreck of the SS Leopoldville in 1984. Cussler's book The Sea Hunters devotes a chapter to the sinking of the SS Leopoldville. Ben Hopkins was the son of Adelbert and Lucy Hopkins, and grandson of Sgt. Albert Baker, a resident of Sibley's Corners (now Wixom) who died from injuries sustained in the Battle of Chickamauga during the Civil War. Sergeant Ben Hopkins was an airplane mechanic stateside during WWI; he had the rare experience of riding in a military biplane while in the service, only a few years after the Wright Brothers' historic first flight. Back home, he worked as a thresher, part of the Hopkins family well known business. Later Ben was employed by Massey Harris Implement Company. He worked at the Northville (MI) Ford Plant for 30 years, where he was a machine operator and plant guard. Hopkins married Alice Palmer on June 5, 1925. Ben was a member of the Lakeside Oddfellows Lodge. Ben P. Hopkins is buried in Wixom Cemetery. POW: Taken as a prisoner Pemberton Prison, Andersonville Prison Camp, Florence Prison. Daniel Johnson Jr., the son of Michigan pioneers Daniel Sr. and Abigail (nee: Ketchum) Johnson, was born and raised on his father's 140 acre farm in Novi Township (now Wixom). He attended district schools during his childhood. To further his education, he spent one term in Ypsilanti, one in Milford, and one winter at school in Battle Creek. Upon reaching adulthood, he taught school in Missouri and Kansas. Soon after returning home to Michigan, at age 23, he enlisted in the Union Army as a Corporal. His regiment went to Covington Kentucky and became a part of General Rosecrans' Army of Cumberland. Corporal Johnson fought in the Battle of Chickamauga under General George Thomas, AKA The Rock of Chickamauga. After being taken as a prisoner of war, Johnson was taken to Atlanta for several days, sent to Belle Isle, and transferred to Pemberton Prison in Richmond. He spent the winter in Danville, Virginia, before being held in Andersonville Prison from April 21 to September 10, 1864. While there, he developed scurvy and rheumatism. He was transferred to Beauregard Racecourse in Charleston, South Carolina for 3 months. After that, he was sent to Florence Prison, and back to Charleston by boat. Next, he was held in Fortress Monroe and Annapolis. He was exchanged and sent home on furlough, as his health was so poor that he was unable to walk. While he recovered, he purchased his father's farm. He married Charlotte Perrigo on March 9, 1865. (Later, Charlotte's sister, Harriet, would marry fellow Company I Michigan 22nd Infantry veteran Warren Baker.) Daniel rejoined his regiment at Chattanooga, until they were mustered out. He returned to his farm and bride after the war. The couple became dedicated members of Wixom's Free Will Baptist Church, where Mrs. Johnson was the organist, a member of the choir, and a Sunday School teacher. She also taught 12 terms of school in Oakland County. Dan was a staunch Republican, and represented the Wixom Republicans at the Lincoln Club Banquet in 1890. He was a delegate at county, district and state conventions. He publicly advocated temperance. Daniel was also a well known farmer and stock raiser, raising sheep and Durham cattle. Johnson was a member of the Grand Army of the Republic (G.A.R.) Heber Le Favour Post 181 in Milford. Charlotte was a member of the W.R.C of Milford. Daniel and Charlotte moved to Pontiac; they are listed as residents there in the 1900 census. Daniel died in 1908. His death certificate lists him as a resident of Pontiac at the time of death, with occupation of janitor. Charlotte passed away the following year. They are buried in Wixom Cemetery. Daniel Johnson is included in the book Record of Service, Michigan Volunteers in the Civil War 1861-1865, vol. 22, p. 82. He is featured in the book Portraits of Governors in Michigan & Biographical Album of Oakland County, Chicago, Chapman Brothers, 1891, pp. 310-311. Oscar Kelsey was the son of Orson and Lucy (nee: Moore) Kelsey. The Kelsey family moved to Michigan in 1845, traveling across Lake Erie, according to the memoirs of Oscar's sister, Cornelia. The family settled in Sibley's Corners (now Wixom), where Oscar spent his youth. At age 21, he enlisted with the Union Army for one year, and joined his neighbors who already were soldiers in Company I of Michigan's 22nd Infantry. When the regiment was mustered out in June of 1865, he transferred to Michigan 29th Infantry, along with other soldiers that had not yet completed their term of service. While with the 29th Infantry, he was promoted to Corporal. He was mustered out in September of 1865. Oscar married Francis Eddy on January 14, 1880. They had 3 children: Alta, Orson and Verne. A well-known local musician, Oscar played 2nd B flat cornet. He was a member of both the Walled Lake and Wixom Cornet Bands in the 1880's. By 1900, he had left Wixom for Detroit, where he became a member of G.A.R. Fairbanks Post 17. He died at age 92. There is a Kelsey family memorial obelisk in Wixom Cemetery where his parents are buried. Though Oscar is not buried there, the monument includes his name and birth date. He is buried in Detroit's Woodmere Cemetery. Oscar Kelsey is included in the book Record of Service, Michigan Volunteers in the Civil War 1861-1865,vol. 22, p. 84. Honors: Sergeant First Class La Bohn is memorialized on the Vietnam Veteran's Memorial, VVM Wall, Panel 37w, Line 13. On that fateful day, November 30, 1968, at 1200 hours, then Corporal La Bohn, age 26, of Wixom MI, was a passenger along with six other Army personnel (Major Samuel K. Toomey, 1st Lt. Raymond C. Stacks, Sgt. Richard A. Fitts, Sgt. Arthur E. Bader, SSgt. Klaus D. Scholz, and Cpl. Michael H. Mein) and two South Vietnamese pilots on a classified mission, when their Sikorsky Choctaw Cargo Helicopter, known as the "King Bee," was his by a 37 mm anti-aircraft shell at less than 4000 feet. The aircraft crashed and burned in the jungle, 25 miles northwest of A Shau Valley in Laos. Because the area was heavily infiltrated by the North Vietnamese Army, there was no ground search for the men at that time. Witnesses said that the helicopter burned. An aerial search was conducted, and no survivors or bodies were seen. Search and rescue personnel noted that although the helicopter was burned, the pilot's door was open, and his helmet was located intact, about 25 to 30 feet from the crash site. When the aerial search was completed, the American men were declared Missing In Action. Twenty years later, in March 1988, the area was examined by a joint US/Laos team; the dog tags of Major Toomey, 17 teeth and 147 bone fragments were collected at the crash site. After clearance from the Vietnamese government, the remains were examined by the Central Identification Laboratory in Hawaii. In January 1990, two of the teeth were identified as belonging to Sergeant Fitts. The remaining body fragments were said to be unidentifiable. Fitts teeth were buried in Boston, Massachusetts. In February 1990, the Department of Defense declared that the remaining bone fragments belonged to the crew; all were now declared Killed in Action. The fragments were buried in one grave; the names of all of the crew members were listed on the tombstone. There had been a previous incident, where Marine Sgt. Ronald Ridgeway was presumed to be Killed In Action despite no positive identification. He was later found to have been a Prisoner Of War, held captive for years. Sergeant La Bohn's sister, Lou Ann, was concerned that her brother was never positively identified. She requested that his name be removed from the tombstone. In January 1991, she was told by the Department of the Army that she would have to pay $1810.25 for a replacement headstone. Senators Jesse Helms and Bob Smith intervened on her behalf, and a new tombstone was placed in July 1991, this time without Sergeant Russell's name, at no cost to his family. His remains have never been identified. Sergeant First Class La Bohn is still Missing In Action. William Lambert was the son of Peter and Sarah (nee: Banske) Lambert. According to U.S. Census records, William lived with his parents and siblings in Milford MI in 1850; they resided in Commerce in 1840. William may have had a sister, Mary, who was the step-mother of Mortimer Dutcher, another Civil War veteran featured on this page. Both William and Mortimer enlisted in the First U.S. Lancers of the Union Army. William was a Corporal with Company B, enlisting at Commerce on October 29, 1861, when he was 23 years old. He was mustered January 21, 1862. This Michigan regiment was not accepted for service because there were too many Canadian citizens in the roster. All of the 1st U.S. Lancers were mustered out on March 20, 1862 in Detroit, without fighting in the war. Less than 5 months later, William enlisted as a Sergeant in Company I Michigan 22nd Infantry. After serving honorably and faithfully, he was mustered out of service with the rest of his regiment. He died just one year after returning home from the war, when he was 28 years old. First Sergeant Lambert is the highest ranking Civil War veteran buried in Wixom Cemetery. He is buried near his father, and siblings George and Norman, who all preceded him in death. William B. Lambert is included in the book Record of Service, Michigan Volunteers in the Civil War 1861-1865, vol. 22, p. 88, and Record of Service, Michigan Volunteers in the Civil War 1861-1865, vol. 45, p. 171. Earl MacDonald married Lena E. Crosby. Earl and Lena are buried in Wixom Cemetery. Daniel McGuire was born in 1830. After enlisting in the Civil War Union Army at age 35, he joined the prestigious 1st Michigan Engineers and Mechanics regiment at Graysville, GA on August 22, 1864. McGuire was among more than 900 men who were actively recruited after the regiment had already been established. This skilled regiment built bridges, forts, blockhouses and saw mills and destroyed Confederate railroads and bridges. He was mustered out one year later. After the war, Dan and his wife Francis (who was born in 1847) lived in Commerce Township (now Wixom). He was a carpenter by trade and a trustee of the Wixom Cemetery Association. Francis was a member of the W.R.C of Milford. Francis died in 1921, outliving her husband by 23 years. D.C. and Francis are buried in Wixom Cemetery. Daniel C. McGuire is included in the book Record of Service of Michigan Volunteers in the Civil War Vol. 43, First Engineers and Mechanics, p. 131. William H. Merithew was the son of William and Philomela (nee: Wisner) Merithew. In 1832, one year before William H. was born, the family moved from New York to Oakland County MI. In 1833 they moved to a farm in West Bloomfield Township. The Merithew children were educated in log schoolhouses in the district. This was a staunch abolitionist family. Philomela was the sister of Moses Wisner, who was governor of Michigan from 1859-1861 and Colonel of the Michigan 22nd Infantry. George Wisner, another one of her brothers, was co-owner of the famed New York Sun newspaper, where he was well known for his anti-slavery editorials. After moving to Michigan, George led an Oakland County Michigan abolitionist group. William (Philomela's husband and father of William H.) was a conductor on the Underground Railroad, leading former slaves to Canada. William H. Merithew may have also been involved in the Underground Railroad, according to one source. He married Lucinda Vradenburg in Novi MI in 1856. Six years later, William H. enlisted in the Union Army at age 29. (His elder brother, Edwin R. Merithew, also enlisted, in Company E 8th Michigan Infantry.) Private William H. Merithew was mustered out with his regiment at the end of their term of service. After the war, William H. became a successful cooper and produce dealer in Wixom. He was a member of the Grand Army of the Republic (G.A.R.) Heber Le Favour Post 181 of Milford. Lucinda was a member of the W.R.C. of Milford. They were highly respected in the community. Lucinda died on March 23, 1901, seven years before her husband. They are buried in Wixom Cemetery. William H. Merithew is included in the book Record of Service, Michigan Volunteers in the Civil War 1861-1865, vol. 22, p. 101. David "D.W" Morrison was born in NYC, the son of Joseph and Nancy (nee: Wark) Morrison. D.W. went to work at age 14, first as a shoe salesman and a later in the shoe finding business. Being a patriotic man, he enlisted in the Union Army during the Civil War. Morrison served under the command of Colonel Fred A. Conklin. His regiment was sworn in while on board a transport enroute to Baltimore. They traveled from Baltimore to Washington, where they were assigned to the 9th Army Corps. The regiment also served at Muddy Branch and Harper's Ferry. Private Morrison and the regiment served 110 days including much picket duty, before being mustered out. D.W. married Elizabeth Wright in New York on July 25, 1872. They moved to Michigan in 1878, and settled on a farm in Commerce Township, just north of Wixom, where D.W. built a new home. Morrison cultivated nearly 70 acres; his livelihood included grain and stock and raising horses. Though the couple had no children, they helped to raise a boy and girl. The family was active in the Wixom and Milford communities. David Morrison was a member of the G.A.R. Post No. 181 in Milford, and belonged to the Milford Masonic order. He died sometime between 1900 and 1910. Elizabeth died in 1923; she is buried in Milford's Oak Grove Cemetery. David W. Morrison is featured in the book Portraits of Governors in Michigan & Biographical Album of Oakland County, Chicago, Chapman Brothers, 1891, pp. 483-484. Charles Nelson's wife was Marie. Their son, Wilbur served in the U.S. Navy during WWII. Charles, Marie and Wilbur are buried in Wixom Cemetery. Seth Noble was 39 years old when he joined the Union Army. He was among the oldest men to enlist in Michigan's Twenty Second Infantry from Wixom (only Edwin Bullard was older). Corporal Seth Noble served honorably, but was discharged early due to disability caused by illness. After the war, Seth belonged to the Milford G.A.R. and his wife, Mary, belonged to the the Milford W.R.C. Both were beloved members of the community. Seth died July 10, 1897, Mary in June 1906. Seth and Mary are buried in Wixom Cemetery. Seth Noble is included in the book Record of Service, Michigan Volunteers in the Civil War 1861-1865, vol. 22, p. 108. Ernest Oldenburg was the eldest son of Mr. and Mrs. Chris Oldenburg. Ernest grew up in Wixom and attended local schools. He was a faithful member of the Free Will Baptist Church of Wixom, where he participated in the Young People's Class. Ernest enlisted in the Army when the U.S. entered WWI in 1917. As a Private First Class, he and Company M of the 125th Infantry departed Hoboken, New Jersey on February 10, 1918. Early in the summer of 1918, Mr. and Mrs. Oldenburg received a telegram from Washington notifying them that their son, Corporal Ernest Oldenburg, had been killed in battle. On July 7, 1918, a memorial service was held at the Free Will Baptist Church of Wixom. Rev. F.A. Brass of Walled Lake officiated, with assistance by Rev. O.B. Ansted. Three years later, in 1921, Corporal Oldenburg's body was brought home to Wixom on the 6:16 train. At his funeral, the Milford Band and 75 American Legion members escorted his flag draped casket. Mourners from Wixom, Milford, Highland, New Hudson, Walled Lake, Commerce, Pontiac, Northville, Plymouth, and Owosso attended the service; so many came to pay their respects, that hundreds of people were unable to fit into the church. He was buried in Wixom Cemetery, June 5, 1921; Rev. F.A. Brass again officiated, this time assisted by Dr. Brooke of Milford. The American Legion Post 216 of Milford places a wreath at his grave every Memorial Day. He was the first in this community to enlist, first to be called, and first to give his life." *Above information is from Milford Times July 12, 1918 and June 10, 1921. In 1846, Silas Parker Jr. was born to Michigan pioneers Silas N. and Mahala Parker Sr. Silas Jr. was one of 9 children, growing up on the family farm in Lyon Township, bordering Wixom. One of his brothers, Homer, was a member of Michigan 22nd Infantry, along with many local residents. Silas enlisted in the second organization of the Michigan 4th Infantry when he turned 18 years old, the minimum legal age. After serving his country, he was mustered out with his regiment. He married Edna Ling on April 19, 1871. Silas and Edna made their home in in Wixom, where they were active participants in local activities. They frequently hosted community meetings at their home. Silas was a member of the Heber Le Favour (Milford) Post of the G.A.R. Edna was a member of the W.R.C. of Milford. Edna died nine years after Silas, in 1917. They are buried in Wixom Cemetery. Silas N. Parker is included in the book Record of Service, Fourth Michigan Infantry, Civil War 1861-1865, p.175. Homer N. Parker was the son of Michigan pioneers Silas N. (Sr.) and Mahala Parker. Homer was one of 9 children, growing up on the family farm in Lyon, at the border of Wixom. Though living just outside of the boundaries of Wixom, the family was considered a part of the community. Both Homer and his younger brother Silas N. Parker Jr. served in the Civil War. Homer enlisted in Company I of Michigan's 22nd Infantry at age 22, and was mustered on the same day. He joined the regiment in Chattanooga TN, on February 18, 1864. The regiment had been in service since September 1862. Private Homer Parker transferred to the Michigan 29th Infantry on June 26, 1865, when the 22nd Infantry completed their term of service. He was promoted to the rank of Corporal while he served with Company I 29th Infantry. Corporal Parker was mustered out with the other members of the 29th Infantry. After discharge, Homer made his home on a farm in Lyon MI. He married Sarah Elizabeth "Libbie" Covert on December 31, 1865. They had 2 daughters, Maggie and Nettie. Homer and Elizabeth are buried in New Hudson Cemetery. Charles Pattan was the son of Civil War veteran William Pattan and Almira (nee Montel) Pattan, and grandson of early Wixom MI residents Jeremiah and Polly Pattan. Born in Nebraska, Charlie moved to Michigan with his mother after his father died. His uncle and aunt, John and Sarah Pattan, raised him at their home in Wixom after his mother's death in 1885. Charles attended Wixom School while living at the Pattan farm on the north side of Pontiac Trail. He later returned to Nebraska, where he enlisted in the U.S. Army with Troop C of the 4th Regiment of Cavalry. At the time of his enlistment, his occupation was a harness maker. He first served on a peace-keeping mission after the Philippine Insurrection, from December 19, 1903 until June 29, 1905, being discharged at Ft. Walla Walla WA. He re-enlisted at Ft. Walla Walla on July 8, 1905, serving in the Phili Islands from October 3, 1905 through October 24, 1907. He was a 1st class marksman in 1904 and 1905, and qualified as a sharpshooter in 1907 and 1908. Military records indicate that he was a Saddler, with good horsemanship skills. He served as an honorable and faithful soldier for 4 years, 6 months, and 19 days, before being honorably discharged on July 4, 1908 in Ft. Meade SD. He married Frances Cramer on October 21, 1911. They made their home in Tyrone Township, Livingston County MI. They were parents of four sons, the last being born one month after Charles' death from pneumonia at age 41. Charles and Frances are buried in Oakwood Cemetery, Fenton MI. Abel G. Peck was the son of Abel and Huldah (nee: Abernathy) Peck. The family moved to the new state of Michigan, and settled in section 35 of Milford. On June 6, 1846, at age 26, Abel G. Peck married Caroline Sandford, daughter of Michigan pioneers Mr. and Mrs. James Sandford of Novi MI (now Wixom). Abel G. and Caroline married and became the parents of two daughters, Alice and Caroline. At the time of the 1850 census, the young family lived near the Sandfords. Shortly after, wife Caroline and 2 month old baby Caroline died. Two year old Alice was then raised in the home of her maternal grandparents. Abel G. soon remarried, to Mary Reed of nearby West Bloomfield. They moved to Hillsdale County, on 960 acres owned by Sandford. Daughter Ella was born in 1854. When she was 18 months old, the family relocated to Montcalm County. Soon after, tragedy again struck the Peck household. Mary, who had just given birth, died along with her newborn baby. Initially, Ella was placed in the care of the Sandfords, but in 1858, she was welcomed into the home of Mr. and Mrs. Henry Cobb of the Northville-Farmington MI area. Abel G. Peck made frequent trips to see his daughters and provide for them, while also occasionally staying with his brother in Nankin (now Westland) MI. Abel G. often wrote letters to them and their families, letters which have been preserved to this day. When President Lincoln asked for soldiers to fight in the Civil War, Abel G. Peck enlisted at age 42, as a Corporal. The regiment, which was made up from men from Wayne County, left Detroit on August 29, 1862. Corporal Abel Peck was assigned the duty of First Color Bearer. He was promoted to Sergeant. In July of 1863, the regiment engaged in the Battle of Gettysburg. During the first day of battle, Sergeant Abel G. Peck was killed in action, one of the first to fall. Colonel Morrow later said "I have lost my color-bearer, Abel G. Peck, a brave and faithful soldier, a man greatly admired for his almost saintly character." Sergeant Abel G. Peck was laid to rest in the hallowed grounds of Gettysburg. His daughter Alice later would marry Willard C. Wixom, the man for whom the City of Wixom is named. Daughter Ella married John Porter; they made their home in Montcalm County, on the land she had lived with her parents so many years before. Years later, George Woodworth, grandson of John and Ella Porter, would live in his great-grandfather's childhood home in Milford. George was an active member of the community of Wixom, and was once President of the Wixom Historical Society. Abel G. Peck is included in the book Record of Service, Michigan Volunteers in the Civil War 1861-1865, vol. 24. John Roberts was born in New York in May of 1846, the son of Emory and Maria Roberts. By 1860, he was living in Novi (now part of Wixom) with his father and siblings. John enlisted in the Union Army when he was 18. After serving his country for three years, Private John L. Roberts was mustered out with his regiment. He married Mary A. Pennel on January 9, 1868, in Farmington MI. They made their home in Milford and had one daughter named Nellie. The 1900 U.S. Census lists John L. Roberts as a boarder at Albert Cummings' hotel/boarding house in Wixom. The hotel had been the location of the Michigan 22nd Infantry's famed 1879 reunion photo. Later, Roberts moved to the Grand Rapids Michigan Veterans Home. He died December 7, 1908, and is buried at the Grand Rapids Veteran's Home Cemetery. Watson Alonzo Sibley was born in Sibley's Corners, the son of pioneers Alonzo and Sarah (nee: Heath) Sibley. Alonzo was the first permanent settler in the area; the community was named for him because of his generous land donations for a cemetery and church. 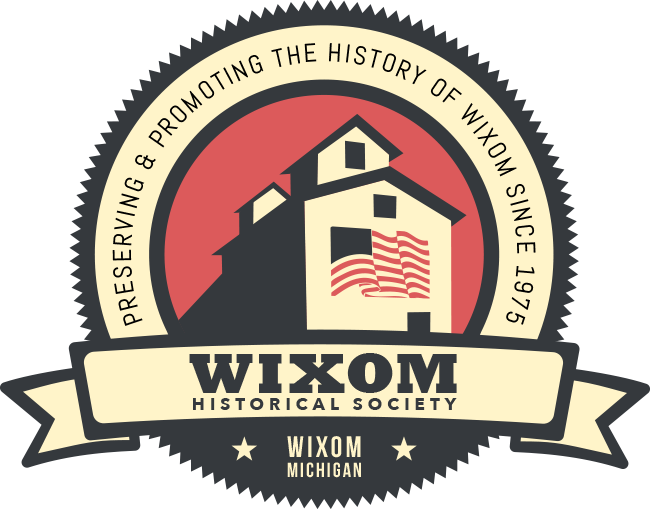 (Later the town name would be changed to Wixom). Alonzo was present at the famous "Under the Oaks" meeting in Jackson MI in 1854, where the Republican Party was formed as an anti-slavery party. Watson enlisted in the Union Army at age 18 when former Michigan Governor Moses Wisner formed a regiment that included men from Oakland County. Watson Sibley was one of eight new recruits from Company I who purportedly removed a bell from Samuel Williams' cow in Commerce Township near Walled Lake; the cowbell would become Michigan 22nd Infantry's mascot. During the Civil War, Corporal Watson Sibly was a hospital steward. He was mustered out along with the rest of his regiment. He moved to Muskegon MI in 1869, where he became a member of Phil Kearney G.A.R. Post 7. He married Margaret Sarah Hubbell on October 27, 1870. They had four children: Guy, Caroline, May and Cora. Watson was employed as a druggist. Watson and Margaret both passed away in 1924. They are buried in Restlawn Cemetery in Muskegon, MI. Watson A. Sibly (SIC) is included in the book Record of Service, Michigan Volunteers in the Civil War 1861-1865, vol. 22, p. 130. Honors: Sergeant Sidor is honored on the Vietnam Veteran's Memorial, VVM Wall, Panel 31w, Line 21. Michael Sidor grew up in Wixom, and graduated from Walled Lake High School in 1966. After enlisting in the U.S. Army, he started his tour of duty on March 25, 1968. His service occupation was Infantry Indirect Fire Crewman. At age 21, Sergeant Michael Sidor was killed from artillery rocket mortar during hostile action in or near Quang Ngai Province, South Vietnam. Sergeant Sidor is buried in Thompsonville Cemetery, Thompsonville MI. William W. Sly was the son of Wixom pioneers Daniel and Catherine Sly. Daniel had purchased 40 acres of land in Commerce Township MI from the U.S. government in 1837, when William was 3 years old. The property is located at the southwest corner of Potter and Beck Roads. U.S. Census records show that the family still lived there in 1850 and 1860. William married local resident Mary Oysterbank on October 18, 1860. Mary's father, Aaron Oysterbank, performed the wedding ceremony, as he was the Justice of the Peace for Commerce Township at that time. Less than two years later, William enlisted in the Union Army from Commerce Township, which means the newlyweds may have remained in the area. Mary's cousin, Watson Sibly, served in Company I alongside William (Watson's father and Mary's mother were siblings.) Though serving his country honorably, Corporal William W. Sly was discharged from service, due to disability. The date of William's disability leads one to hypothesize that he was injured in the Battle of Chickamauga, but we have not been able to confirm this. William W. Sly is included in the book Record of Service, Michigan Volunteers in the Civil War 1861-1865, vol. 22, p. 132. George D. Spencer enlisted in the Union Army while attending a dance at Sand Hill Hall at age 19. He served six months with his regiment, until they were mustered out in June of 1865. Later, George became a well known Wixom farmer, stock buyer, and drover. A highly respected individual, he also was director of the Northville State Bank for more than 20 years. Spencer married Mary E. Smith on November 1, 1893. They had one son, Vernon, who became a professional baseball player with the New York Giants before returning to work at the family farm. Years later, grandson George W. Spencer would serve as Fire Chief of Wixom. George D. Spencer died in 1927; Mary passed away November 18, 1946. They are buried in New Hudson Cemetery. Spencer farm is still located on the south side of Pontiac Trail in Wixom. George Spencer is included in the book Record of Service, Michigan Volunteers in the Civil War 1861-1865, vol. 30, p.54. Earl Taylor is buried in Wixom Cemetery.